A while ago I subscribed to The Pioneer Woman's blog feeds. She's one amazingly talented woman. Her photos are beautiful and her tutorials and actions for Photoshop are wonderful, but what gets me is how much this woman cooks. Reading her blog posts about food almost always gives me cravings. And I don't think it's just because of pregnancy. I blame her pictures too. So on the Fourth of July after we'd planned to have friends over, changed our minds as they were all out of town, booked a weekend away, and cancelled that when I got sick, we ended up having a small BBQ with 3 of our friends. It was fun, and I couldn't help but try some of Ree's recipes. The day I saw these I had to have them. I craved them. I'd never even had them before and I wanted them like candy. So I made them. 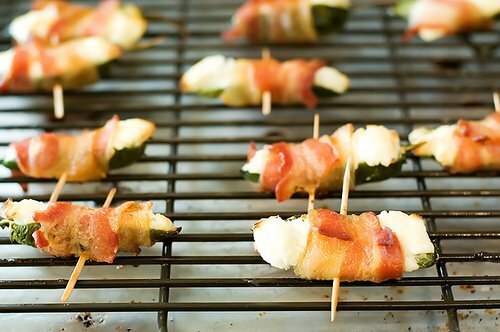 Bacon Wrapped Jalapeno Thingies is one of my new favorite appetizers. I can't believe how simple the recipe is and how divine they are. I must warn you - do not nibble at these, take good sized bites (3 minimum) or you'll really feel the heat of the jalapeno. It you take bigger bites you won't feel the heat so much because you'll have more cheese. I must also warn you: Use gloves so you don't kill your hands, and anywhere you touch after (eyes do not fare well when rubbed with jalapeno oiled hands, just saying). The seeds and membranes are the hottest part so for less heat really get it all out. And lastly make sure your Bacon isn't too thick to bend and wrap, you want the thinner stuff. Oh - and if you don't like Jalapeno Poppers - never fear. I don't like them either, or cheese-sticks for that matter. So please still give them a try. I've been craving these ever since I had them. 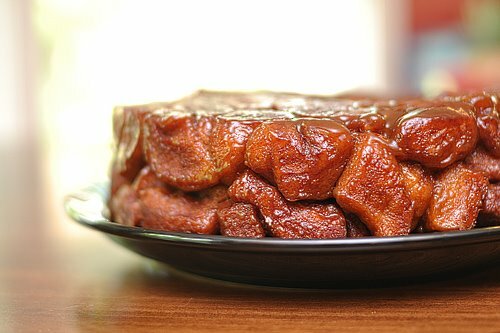 Monkey Bread is one of those things on the bottom of my list to make. Why? Well, I usually make the bread for something else first. Like rolls, loaves, or whatever. There's usually not left over dough. If there was, and this happened probably twice in my life, I made Cinnamon Buns. So when I discovered Ree's recipe for Monkey Bread I had to try it. I must warn you, it's not a recipe for dieters. My husband loved this recipe even more than me. If it wasn't for the heat of summer I'd be making him more. (Sorry, it's just too hot to cook right now.) So for those of you willing to try this here's what I did wrong: everything. OK just kidding, I think two things were what really threw it off. I used 3 of the Buttermilk Biscuit tubes, but the big ones. I think it's meant to be the smaller tube. I also used flaky instead of non-flaky. I'm not sure why that's important. It might have worked with the flaky had I used the right sized tube. I'll let you know once it's not too hot to cook. Lastly, I finally discovered the secret to Dill Dip. I love dill flavored stuff. Dill Pickle Potato Chips, Dilly Potato Salad, Dill all over my vegetables. So it's no wonder I came up disappointed every time I made Dill Dip at home. It was never right. Not even most of the special Dip packages from specialty shops were just right. So I went online to figure out what I was doing wrong. That's when I discovered Pickle Juice was the missing link. 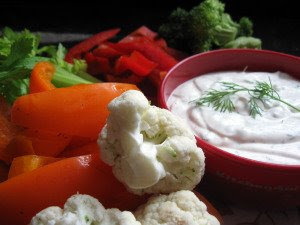 I tried out this recipe for Fresh Dill Dip and fell in love. The flavor was amazing and of course, the fresh dill from my garden made it even better. I know some of you probably have no desire to eat some of the things that I love. But I don't care - for those of you who love food as much as I do, and particularly, think you'll enjoy the recipes above - Happy Cooking and Eating.